The opening of Six Flags Great Adventure's new ride Zumanjaro: Drop of Doom has been delayed because of weather conditions. The ride originally was scheduled to open Memorial Day weekend, but construction of the top of the ride was postponed by a combination of high winds, snow and cold, said Kristin Siebeneicher, a spokeswoman for the park. "Our teams have done an incredible job staying very close to schedule despite Mother Nature's wrath. It is even more amazing considering the dizzying heights of this project," park President John Fitzgerald said in a prepared statement. Fitzgerald is expected to announce an early-June opening date for the ride soon. 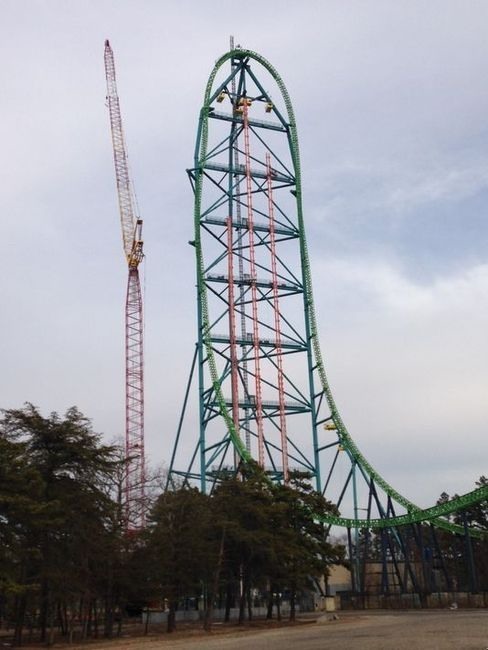 Zumanjaro, which is connected to Kingda Ka, will take riders 41 stories into the sky and drop them back down at speeds up to 90 mph, Siebeneicher said. Three towers have been built on the face of Kingda Ka. Each drop tower has a gondola with eight riders, which rise to the top of the tower in about 30 seconds, according to Siebeneicher. Riders might be able to catch a glimpse of the Philadelphia skyline before they are dropped back down to ground level in 10 seconds. Six Flags Great Adventure is open weekends for the 2014 season, and will begin daily operation Thursday. For more information, visit www.sixflags.com/greatad­ven­ture. Really sad to read that... It is amazing that three drop towers are built in the Queen of the Roller Coasters, is reinvent the product and get new experiences. It will be amazing being in the drop tower and see the train of Kingda Ka rising the top of the tallest roller coaster!